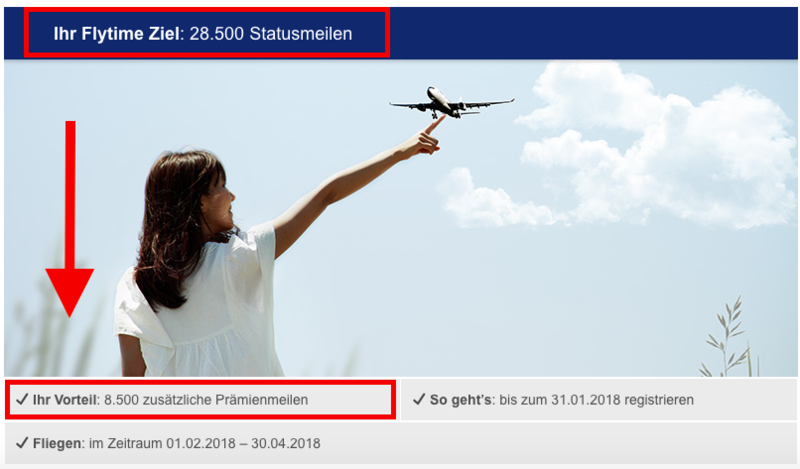 Lufthansa Miles&More is now offering a spring promotion titled ‘Flytime’ to members with targeted offers that include extra award miles after reaching a specific status miles threshold. The promotional period reaches from 1st February – 30th April 2018 and targeted members have to reach a specific, individual amount of status miles in order to receive their bonus. The above targeted offer gives the reader 8,500 award miles if he manages to collect 28,500 status miles in the promotional period, however those miles have to be flown with participating Lufthansa Group Airlines: Austrian Airlines, Brussels Airlines, Eurowings, Lufthansa, SWISS, Adria Airways, Croatia Airlines, LOT Polish Airlines or Luxair. The promotion requires registration via the link available in the email which has to occur until 31st January 2018. If you haven’t received any email with a personal offer yet keep monitoring your inbox the next couple days. It’s not clear if every Miles&More member will be targeted with an offer or just select ones. I haven’t received said email with the promotion offer and registration link yet and I’m probably not alone with that. Not sure how valuable an additional 8,500 Award miles are in terms of motivating someone to book extra flights. If customers already have flights booked sure why not, better than nothing. Also, only flights taken with the Lufthansa Group airlines count towards this promotion. This offer is non-transferable and is not valid in connection with other Miles & More promotions. Only scheduled flights operated by Austrian Airlines, Brussels Airlines, Eurowings, Lufthansa, SWISS, Adria Airways, Croatia Airlines, LOT Polish Airlines or Luxair between 1 February 2018 and 30 April 2018 count. To participate in the promotion, you must register by 31 January 2018. It is only necessary to register once, and your registration is valid for the entire promotional period. Registration for the mileage promotion is, of course, free of charge. Status miles earned on flights by Lufthansa Private Jet or via the Executive Bonus do not count towards your personal promotional target.